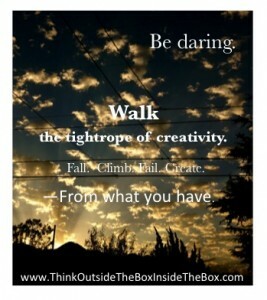 When creating anything there’s always a feeling of walking a metaphorical tightrope with no safety net. What am I doing? Why am I doing it? Is this any good? Will anyone like it? Where will it go? You might fall off any second into failure, which for many of us is avoided as much as death. It shouldn’t be. Failure is temporary. Death is not. What if you fall? Lean into it. Enjoy the ride. Create something on the way down. Then get back up again. Create some more. We fall, we climb, we fail, we create.